Franciscan Well 16th Annual October Beer Festival. Some of the very best! Is was all that jazz and all that beer too in Cork last weekend. 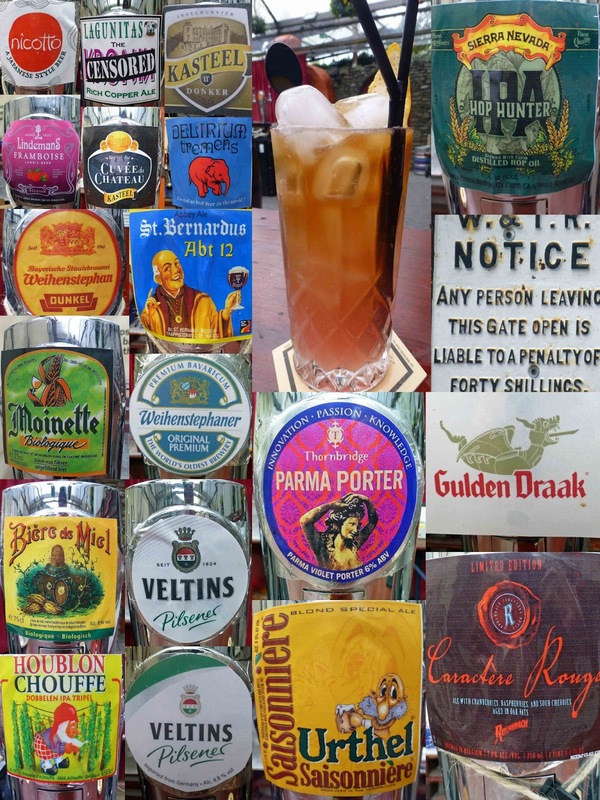 My first outing of the weekend was to the Franciscan Well on North Mall where they had installed a great line-up of top class world beers, quite a few of them “rated amongst the top beers in the world”. But where to start at this 16th annual October Beer Festival? Hard decision to make when you see some twenty or more taps in front of you. And that was just outside. Many more inside, including their own excellent beers. And they also introduced their own Craftail Bar. This is upstairs and is called the Stave and Chime and the cocktails are based mainly on Jameson whiskey and Franciscan beers. But back to the outdoor heated beer tent where a decision had been made for our opening duo: Moinette Bio and Nicotto. The Nicotto (6%) is a Japanese style beer made by the Barcelona Beer Company, made with Sorachi (a hop of Japanese origin) and also includes green tea, jasmine and tangerine peel. A really superb beer, clean and fresh. The Moinette Bio (7.5%) is, as you’ve probably guessed, an organic beer, really well balanced between mellowness, fruitiness and bitterness. This well struck combination is a real thirst quencher, more mellow than the Nicotto, another clean beer that finishes with a hint of clove. 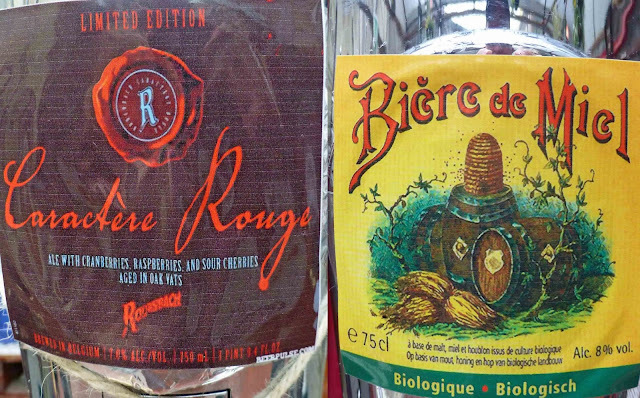 Two good ones to start and the next pair, Rodenbach Caractere Rouge and Biere de Miel, continued the very high standard. The Rodenbach (7%) was possibly the stand out beer. It is billed as a red/brown sour and it is sour but also packs amazing fruitiness. The beer is macerated with fresh cherries, raspberries ad cranberries and, after that, is matured in oak barrels. 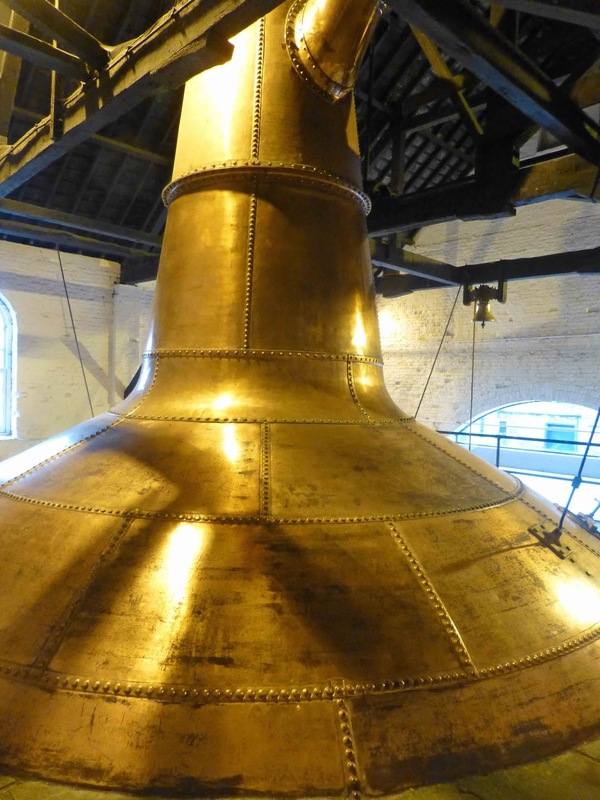 Rodenbach have had a great deal of practice as the brewery was established in 1836. The Biere de Miel (8%) is a honey saison. Don't let the honey put you iff. You’ll catch a pleasant whiff of it in the aromas and a delicate presence on the palate but this is a well balanced refreshing dry beer, again some clove on the finish. All good so far! There were beers there from the UK, Germany, Spain (our 1st one), and the US, but we were mainly on the Belgians and that was the case with the next two. 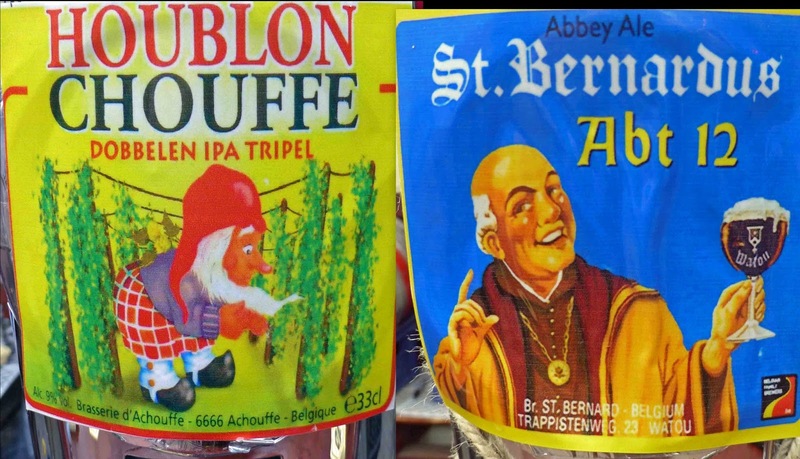 One was the St Bernardus ABT 12 and the other the Houblon Chouffe. The Barnardus (10%) is a quadrupel, full of complex flavours, great fruit and with a superb finish. It is regarded as one of the best beers in the world and would put many a wine to shame. In this context, quadrupel means it is stronger than a tripel which is stronger than a duppel! As it happens our Houblon (9%) is a tripel IPA and another very good one. I must say, the beer descriptions on the Franciscan Well leaflet were pretty much spot-on and I agreed one hundred per cent with their take on this well balanced tripel: big malty body, distinct dryness, and expressive estery fruitiness. And to finish? I had been thinking about two from the dark side until tempted by a cocktail from upstairs: the well named O’Sullivan’s Sour. O’Sullivan was the chieftain that gave the land to the Franciscan monks back in the day and, of course, the Chieftain Pale Ale is in the lovely mix. 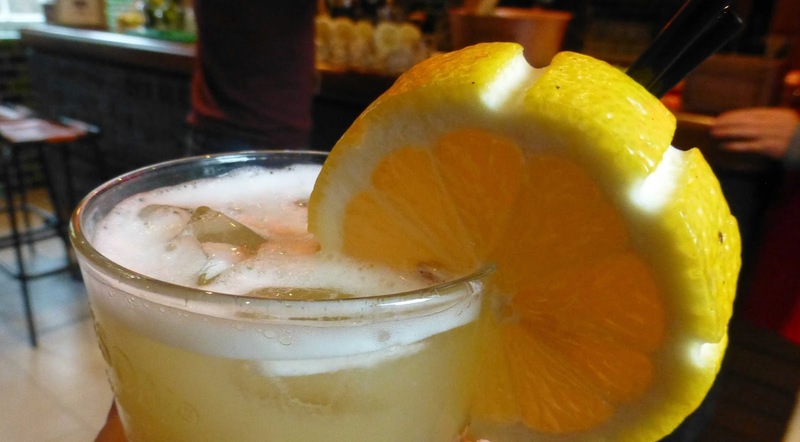 It is made with Beefeater London Dry Gin, St Germain elderflower liqueur, freshly squeezed pink grapefruit juice, grenadine syrup, and topped off with the IPA. Colourful and delightful, a lovely end to a very interesting and rewarding session indeed. From my very early touring days I remembered the best fish and chip shops are to be found in the North. Delicious fresh cod and chips all smothered with lashings of salt and vinegar, and let’s not forget the mushy peas. Food that comes with its own specific gravity, that stings the lips and lies heavy in the stomach afterwards; wash it all down with cheap red lemonade or a warm can of Irn Bru and have a jolly good afternoon snooze. A few years later, still attracted by the economic opportunities of pig flesh, he decided to buy a pile of pigs’ heads, advertising them outside his pub in Fethard. But they did not sell and the heads started to rot on the premises. Eventually, after several complaints… the rueful Bailey contaminated another stream when he threw the hundred or so heads over a bridge in the dead of night. During the summer of 1957, Bailey acted as guide to Ted Nealon, then a young reporter covering the boycott for The Irish Press. from The Fethard-on-Sea Boycott by Tim Fanning (2010). Very Highly Recommended. Greene’s Lunch. Three Great Courses. Two Tell-tale Candles! Three Great Courses. Two Tell-tale Candles! 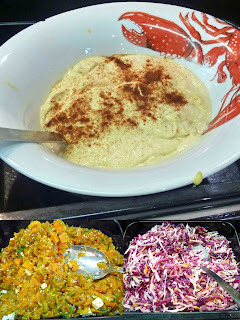 Looking for a lunch that will please both the stomach and the wallet? Stop under the waterfall and call to Greene’s in McCurtain Street. That’s what I did last Sunday for a birthday treat. Well, it had been arranged well in advance as we had quite a group, mainly family. The amazing set lunch menu comes in at €21.50 for two courses, €24.50 for three. And you are guaranteed a terrific meal, cooked and served up by top chef Bryan McCarthy and his colleagues in the kitchen and front of house. I know quite a few guests from last Sunday will be going back again. 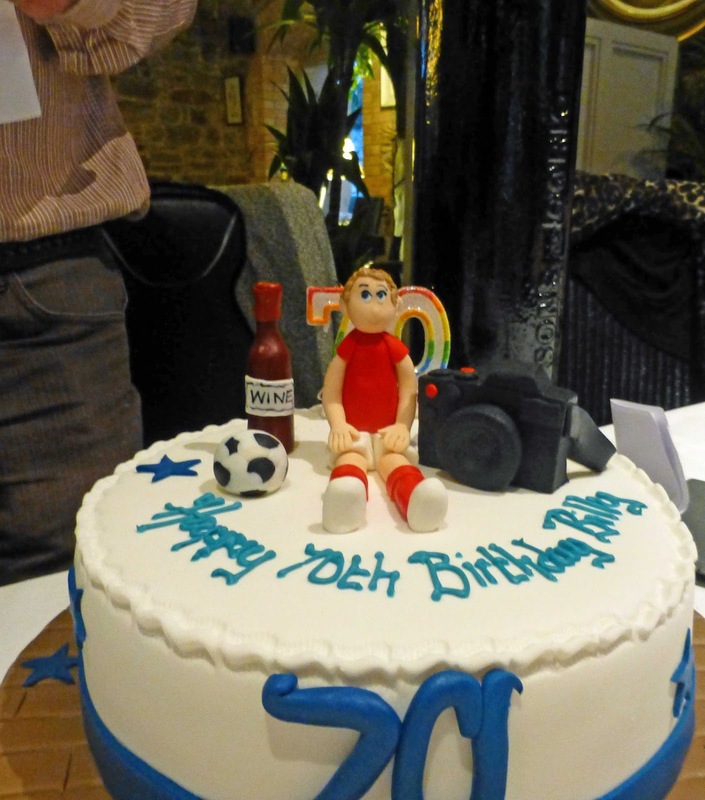 There was a little cake at the end for yours truly but I can't guarantee you’ll get one of those! I was in a fishy mood on Sunday so my starter was the Goatsbridge Trout and Crab, with cucumber, seaweed, squid ink, nasturtium and radish. 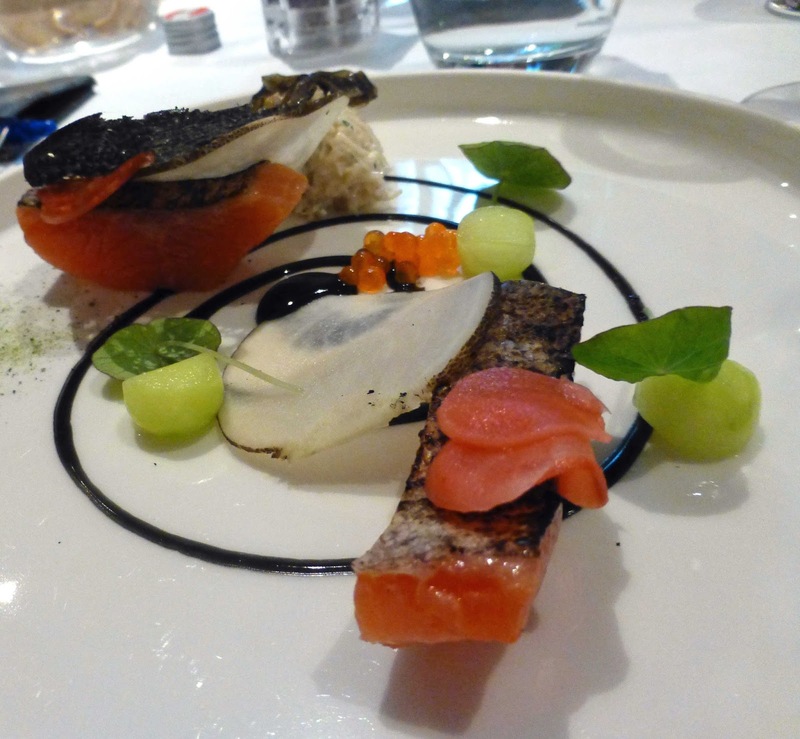 The Curtins raise delicious trout on their long established Kilkenny farm and in Greene's kitchen the fish was in good hands and they produced a dish to delight. Other choices included Goat’s Cheese, Pork Belly, and the Chef’s Soup with seasonal Garnish. Bryan’s trademark Braised Feather Blade Beef, enhanced with Mushroom, Carrot purée, black cabbage, pickled wild garlic stems, was a popular choice as was the Free Range English Market Chicken. 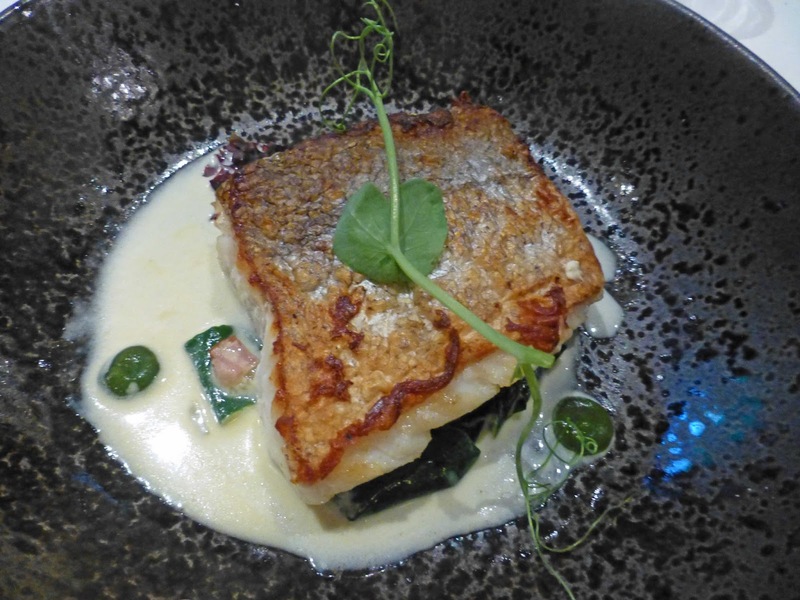 I continued with the fish theme, and enjoyed every tasty bit of the Hake Fillet with sea vegetables, seaweed, smoked sausage and dashi cream. Also on the mains menu and enjoyed by a few at my table was the Ballyhoura Mushroom Risotto with Coolea cheese, potato crisp, pepper dulse and kale. Hake. Note the crispy skin! 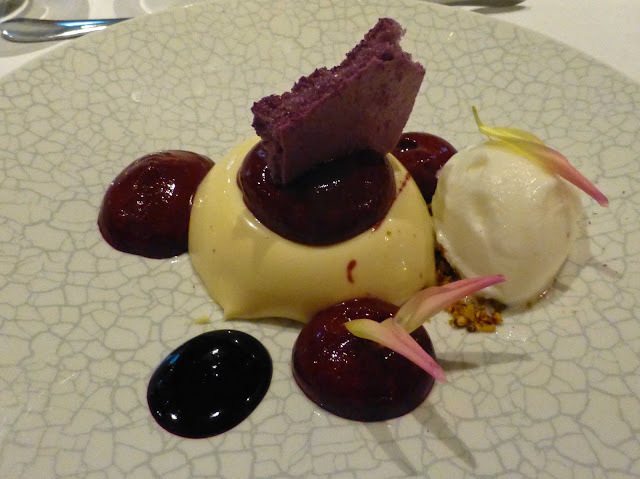 Time then for the dessert, and another great choice. 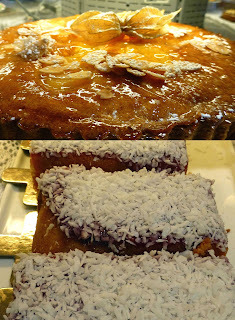 I didn't get to sample the Chocolate Pecan Cremeux Tart nor the Red Wine Organic Poached Pear. But I did steal a bit of CL’s lovely Rose Cottage Fruit Farm Blueberry Tart. 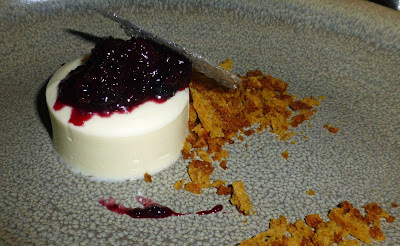 Meanwhile, my own Woodruff Set Cream Pudding, with elderberry and pistachio, was sliding down smoothly. Lots of chat then as the relaxing afternoon came to an end. 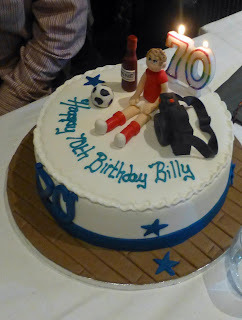 But soon I was called back to my place as that cake, complete with candles, a modest two (but they added up correctly! ), appeared. Just about managed to blow them out. 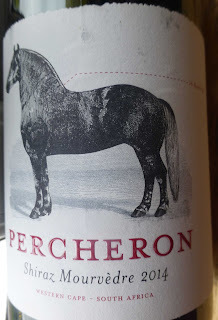 The Percheron horse owes his place on the label to the fact that these draft horses (now a rare breed), once worked the land here; the ancient vines, another national treasure, survive also. 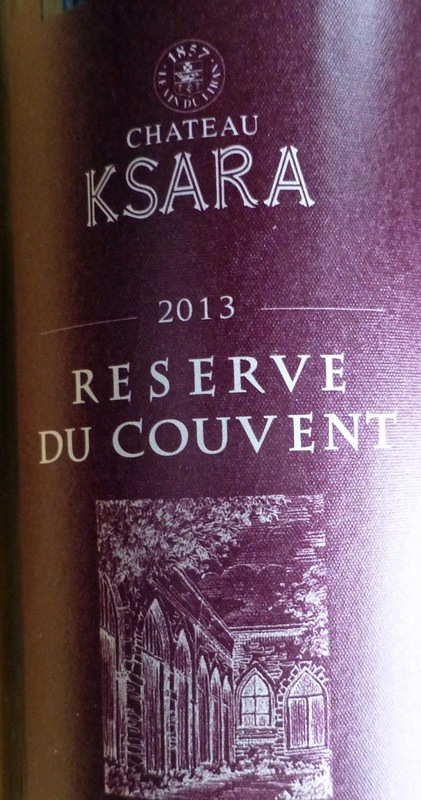 This medium red comes with dark fruit aromas, some savoury notes too. It is warm and rich, spice, vanilla notes too, savoury elements also, tannins more or less fine, and a long and warm finish. Well balanced, well made, great value and Highly Recommended. The producers recommend matching it with smoked meat, red meat and cheeses. 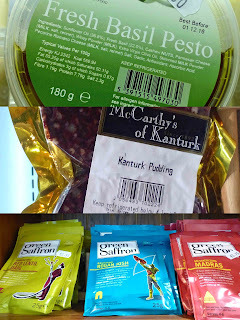 I found it superb with the Macroom Buffalo burgers from Eoin O’Mahony in the English Market, Cork. A dark ruby red is the colour here; it is a little lighter at the rim. There are intense aromas. Delicious fruit too on the complex palate, a drift of pepper also, and fine tannins. Superb balance of fruit and wood and those dark fruits stay with you through the persistent finish. Very Highly Recommended. Though the old cellars, situated underground in the limestone bedrock, most probably date from Roman times, the winery was founded by the Jesuits in 1857. Must have been some nuns there too - there usually were - as couvent is French for convent. The estate is no longer in Jesuit hands but the French influence is strong. Next parish by the way is unhappy Syria. Amazingly, Ksara produces some 3 million bottles per annum. 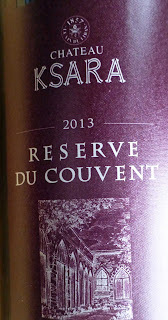 It is a blend, 40% Syrah, 30% Cabernet Franc and 30% Cabernet Sauvignon. 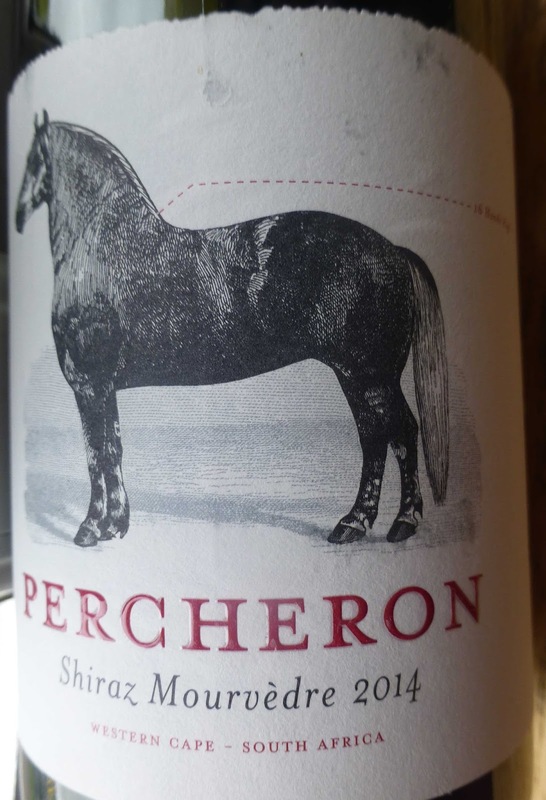 Red meat and small game are the suggested matches for this delicious and complex wine. Just one look and I was hooked. 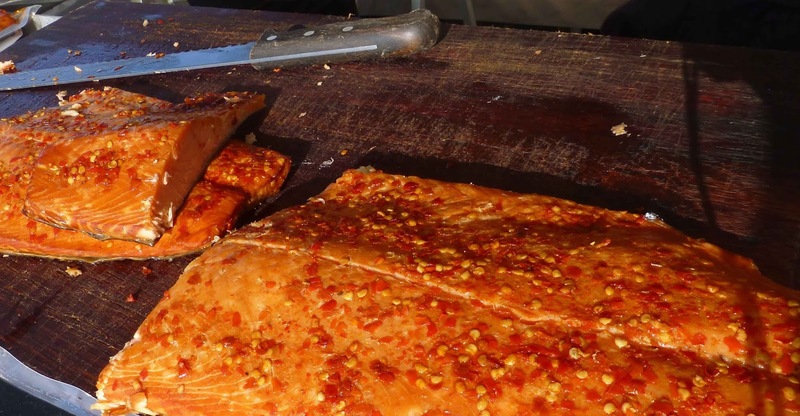 Frank Hederman’s side of smoked salmon lay temptingly on the bare boards of his market table in Midleton. The gorgeous rich shades of red/orange, from the smoke and the added Kashmiri chillies, were enhanced by the autumn sun. There was no need to even taste a sample. Knowing that it had come from an old authentic smokehouse a few miles away and knowing how carefully Frank sources and handles his fish, I bought a piece. And there was no putting it in the fridge when I got home. No, this was to be used within hours. It can, of course, be refrigerated and later served at room temperature or gently re-heated. If you want to slice, that is best done straight from the fridge. It is flakier than cold smoked and indeed is easy to flake for your plate. You’ll find while flaking that every second piece is going into your mouth. Maybe I should have bought more? 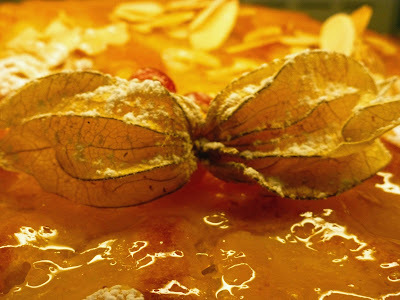 In any event it is absolutely delicious and succulent and our Taste of the Week. Aside from Midleton, you may also buy it in his shop in the English Market and of course he has it for sale online as well. Social Eating Events Begin in Style at Samphire! Eoin takes on the carving duty at this table! No bother to him. 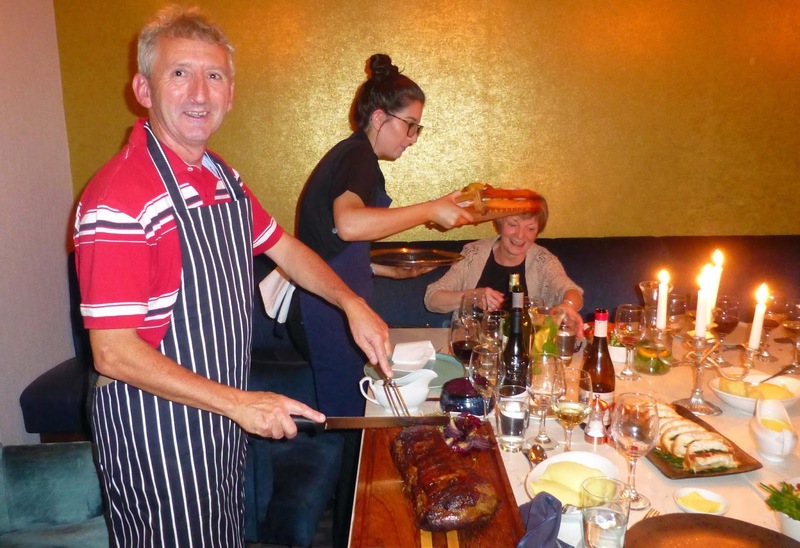 Last Friday’s Dinner Table was the first of the Samphire Social Eating Events in the Garryvoe Hotel. And, judging by its success, it won’t be the last. Indeed, there’s quite a list organised already. So get your friends together for a dinner party with a difference. You’ll have six or eight or so at a table and all the food comes out on platters for sharing, lots of it. 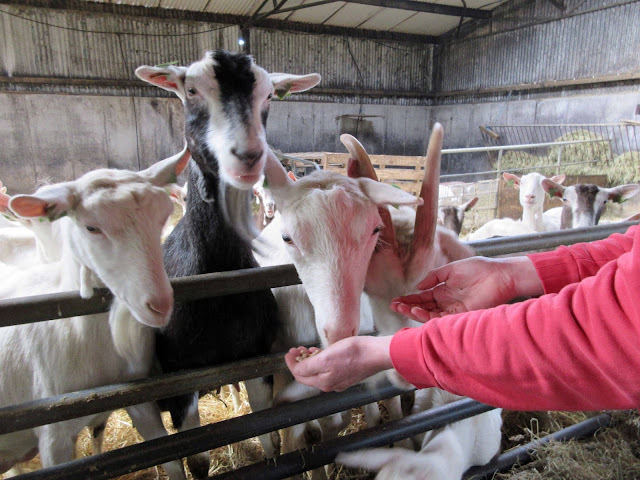 And very good food too, the best of local produce sourced and cooked to perfection by Head Chef Kevin O’Sullivan. Nothing too fancy but dishes that are simply superb served in an causal fun atmosphere with a little jazz in the background. And some events have wine included (Le Caveau wines were included last Friday) and there is a whiskey special coming up too. See the list at bottom. 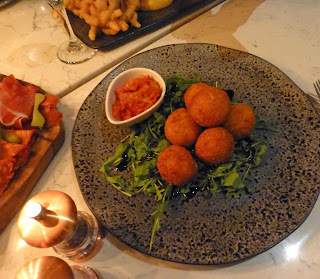 After a drink at the beautiful bar, we were seated with our companions and the starters were served. 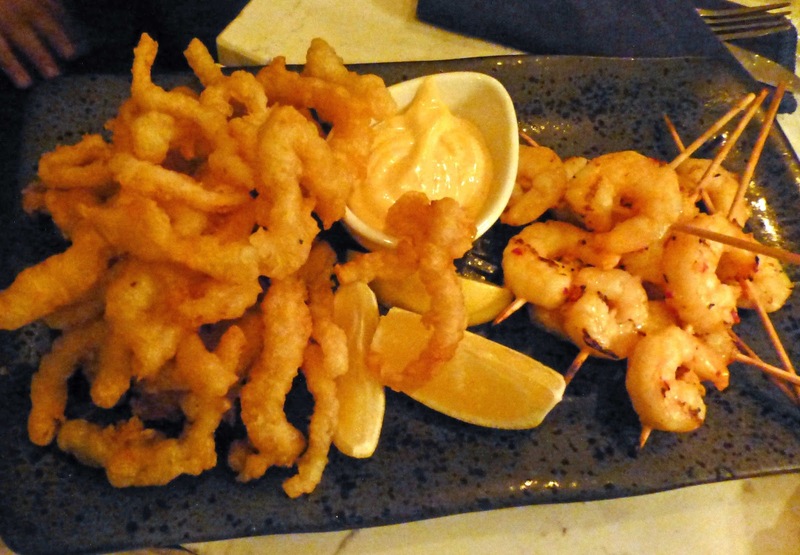 We hardly knew where to look as a series of the restaurant’s favourites arrived at the table: deep fried calamari, skewered prawns, goats cheese boules, venison terrine, chorizo, cured ham, pickled veg, also a selection of breads. And then there was wine, one red and one white. The white was Cuvée Marine by Domaine de Menard in Gascony, a delicious blend of Sauvignon Blanc, Gros Manseng and Columbard. The red was the Gran Cerdo Tempranillo from Rioja in Spain complete with a cartoon label that featured a greedy pig (standing in for the bankers that didn't support the vineyard in its hour of need) eating a big bunch of euro. Good cartoon and excellent wine too. The wines were introduced before each course by Pascal Rossignol and Colm McCan of Le Caveau. The meat for the main course was Roast sirloin of Prime Hereford Beef with a magnificent red wine gravy. And here the fun came in as a volunteer was needed to slice the beef. We had one in Eoin and he did a great job indeed. No need to cut the fish which was Baked Cod en croute with samphire, lemon and chive beurre blanc. Needless to say, they were served with all the trimmings, beautiful veg and excellent roast potatoes too. And the wines were gorgeous as well. The red was Carmin Brilliant “Clos de Caveau” from Vacqueryas in the lower Rhone, its unusual wrap-around label designed by Karl Lagerfeld. A great label and a great wine too. The white wine was the Chateau Turcaud Cuvée Majeure from Bordeaux, a blend of Sauvignon Blanc and Sauvignon Gris. This is named after the local abbey, a big tourist attraction (the vineyard is just alongside), and is well worth seeking out. The place was packed and there was a great buzz in the lovely Samphire, opened early this year. Time now for dessert and time too for another volunteer. 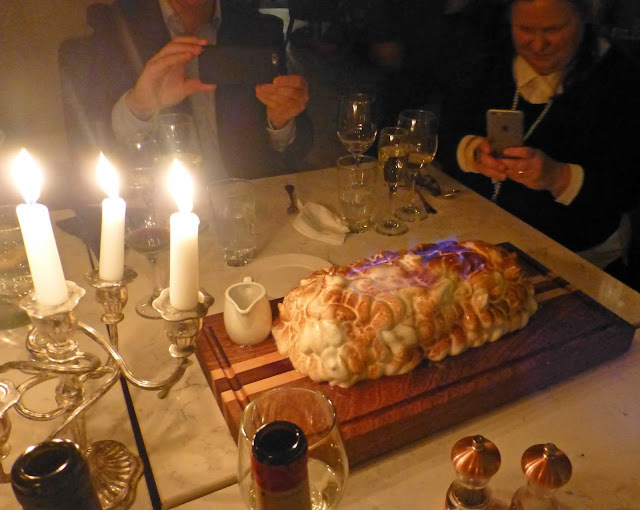 First though there were gasps all round as the Baked Alaska arrived and more as it was flamed. When that died down, Elke took up the knife and dished it out in generous slices. And then a bit of a hush as we tucked into the soft sweetness. Oh my. What would the boys from Le Caveau come up with? They offered a choice of two. One was the Corte Alta Prosecco from the Veneto but the one that really caught my attention, indeed the attention of the table, was the Alain Brumont Gros Manseng Doux from the south west of France, a lovely non-cloying sweet wine, the palate coating sweet fruits balanced by a fresh acidity. Perfect. Not too often you get two beauties from Gascony on a wine matching. Just goes to show that Pascal and company are expert at seeking out these little-known (and well priced) gems. November 25th - Game Night. Longueville Cider, Le Caveau wines, and no less than five courses. Details here. December 15th - Christmas Masquerade Supper, a dinner party with a difference. Fun with a full meal and drinks included. Find out more here. Last week’s Munster Wine & Dine mid-week trip to Midleton was packed with highlights, both at Irish Distillers and later at Sage Restaurant. There was a generous welcome from the team at the Distillery. For me, the tutored tasting by Brian Ledwidge was the outstanding part, as we got to sample three of the very best produced here. We started with the Redbreast 12, a single pot still whiskey. The single by the way refers to a single distillery, not a single pot. Pick up your glass - no need to swish it around as you would with wine - just give it a gentle turn and that will allow the aromas rise. The Redbreast has been matured in Oloroso casks and so it is quite aromatic, reminiscent of a Christmas cake being taken out of the oven, according to Brian. In the mouth, there is a significant “creaminess (from the unmalted barley), fruit (from the cask), and spice (from the pot still), a nice balance of all three”. Brian also told us about the latest Redbreast which has been raised in Lustau casks. Power’s were one of the three companies that merged to form Irish Distillers in the mid 60s and their line was represented here by John’s Lane Release. John’s Lane (in Dublin) was where the original would have been produced. It is nicely spiced from the still. Raised in US (mainly) and Spanish casks, Brian pointed out the vanilla on the nose, also a light apricot.Twelve years (at least) of maturation is rewarded with outstanding flavour and complexity, vanilla, chocolate, caramel, spices, all there together in a long long finish. Peter: "the next guy that contradicts the guide......"
And then we were on to an outstanding premium whiskey, the Midleton Very Rare, made from whiskey that has been matured in US casks only. The casks (no more then 250) to be used are hand-picked by Master Distiller Brian Nation and are between 12 and 22 years old. The resulting blend is nicely balanced with “50 to 60 per cent of the flavour coming from the wood”. Unlike the previous two, this is a blended whiskey. This truly magnificent and much celebrated whiskey is amazingly smooth (after that long maturation), light of fruit, with hints of sweetness and spice, an absolutely outstanding mouthful. There was an earlier tasting also, this coming as we toured the massive warehouse complex, with Daniel as our guide. You have to know your way around here - they build a new one every two months! And these are huge; each warehouse holds 16,800 casks. And the overall “population” is no less than 1.4 million casks. All needed, with more than five million cases of Jameson alone being sold annually. Hard to take in those kind of numbers. The going got a whole lot easier though when Daniel invited Beverly, a MWD member, to open a bourbon cask. She extracted the bung like a veteran and we all enjoyed the whiskey that had been inside since 1991. Still time for another sample, this from a 2001 Sherry cask (much bigger) and probably destined for a Redbreast bottle, another lovely sip. 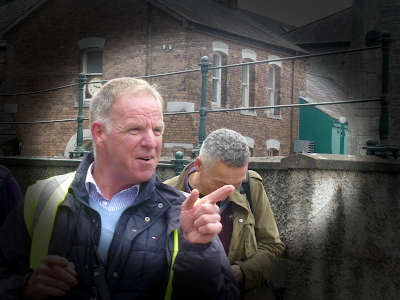 We would see some of that right here on our first walkabout, through the old distillery, the history explained in a lively manner by our guide Peter Corr (also a member of the Munster Wine & Dine, so there was some gentle slagging going on). The old buildings, which have seen duty as a flour mill and as a military barracks, were vacated for the “new” distillery in 1975. 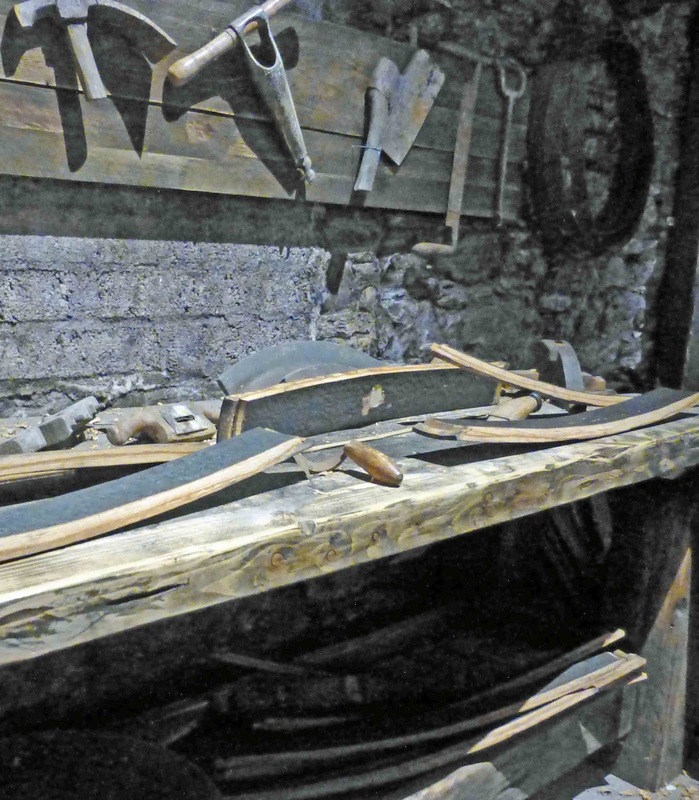 They are full of history and memorabilia, enough to explain the production process to newbies! And its not all old. 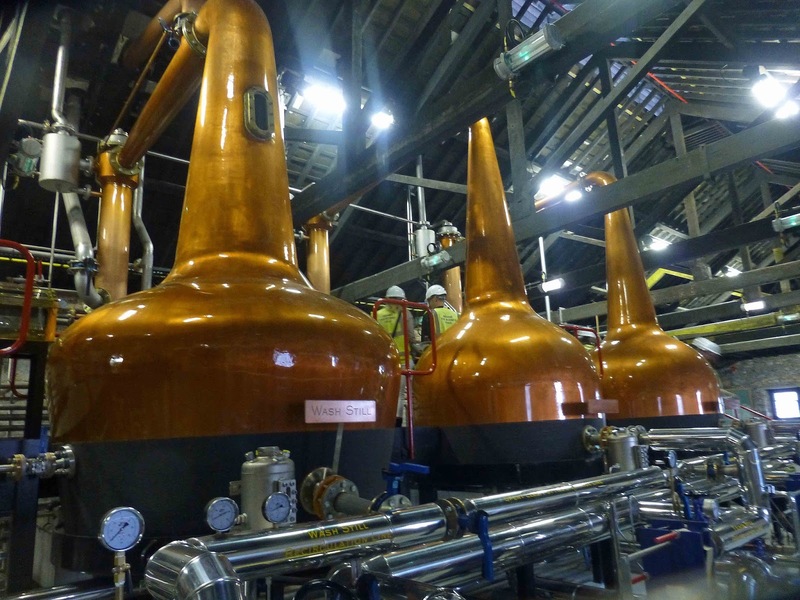 Irish Distillers now have their very own micro-distillery here, three sparkling new copper stills all ready for action. 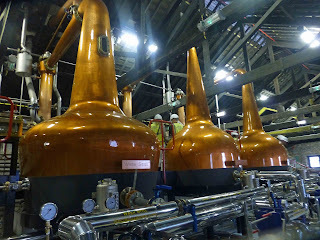 And no doubt, the firm’s distillers - there are eight of them - will be taking full advantage of the possibility of making new and exciting spirits, something that couldn't happen in the huge new distillery with its massive stills always busy. After Peter’s tour, which also included the cooperage, we made our first visit to the Whiskey Academy where we met Brian, David McCabe and Maura Coffey and had our first drink of the afternoon, a very welcome Jameson Sour Old fashioned. 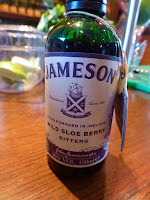 The bitters by the way are a new product: Jameson Sloe Berry Bitters (foraged in the west of Ireland). 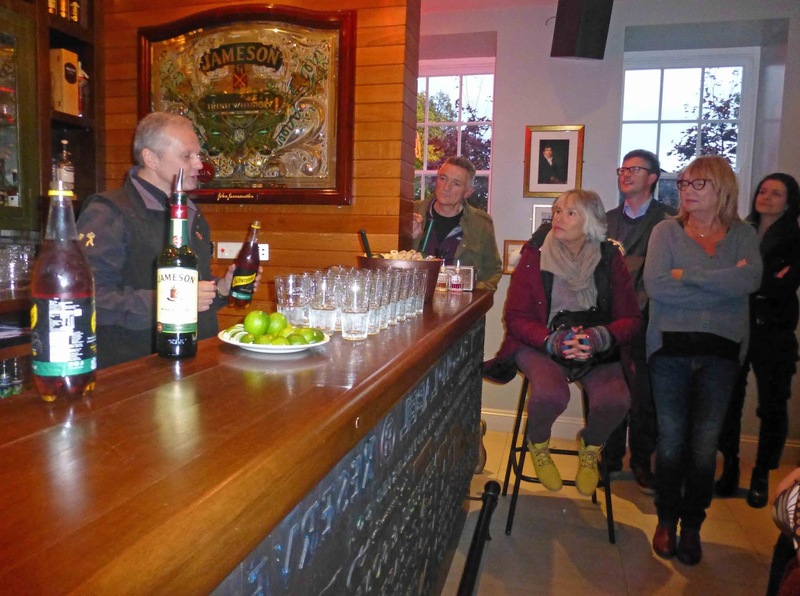 And it was the Academy that also saw our last drink of the informative tour, the Jameson Perfect Serve. 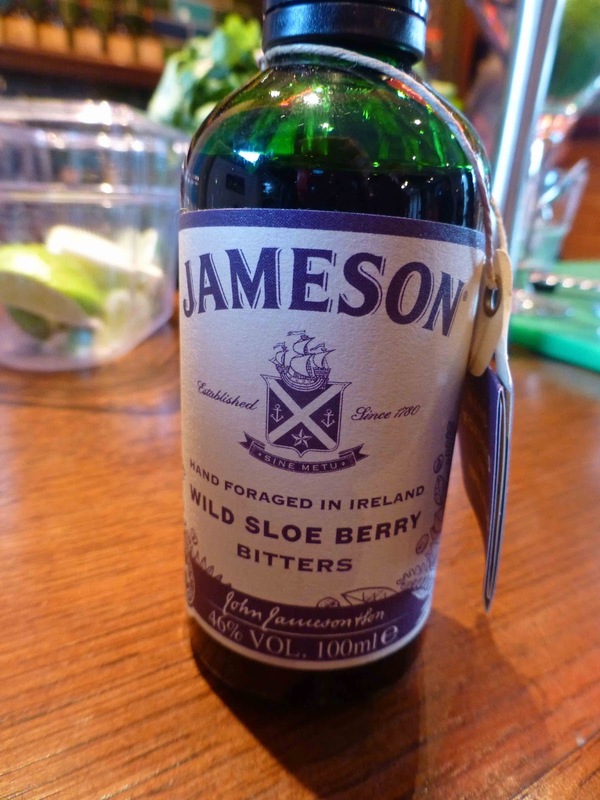 Brian told us that Jameson was well known for “its mixability and is also very popular when mixed with Ginger Ale”. His recipe, more or less, is to use a tumbler with loads of ice. Add a standard measure of Jameson, lime ( “a nice big piece squeezed in”), and top it all up with chilled Ginger Ale. Cheers! After that, it was time to take the short walk out the lane and up the main street and then another warm welcome from chef/owner Kevin Aherne and his team at Sage. We had ordered a meal based on his famous #12 Mile Menu and it was absolutely top notch. Beef filet carpaccio, black onion aioli, purple potato, celeriac. I enjoyed my scallop dish, soft and delicious in a lovely "broth". 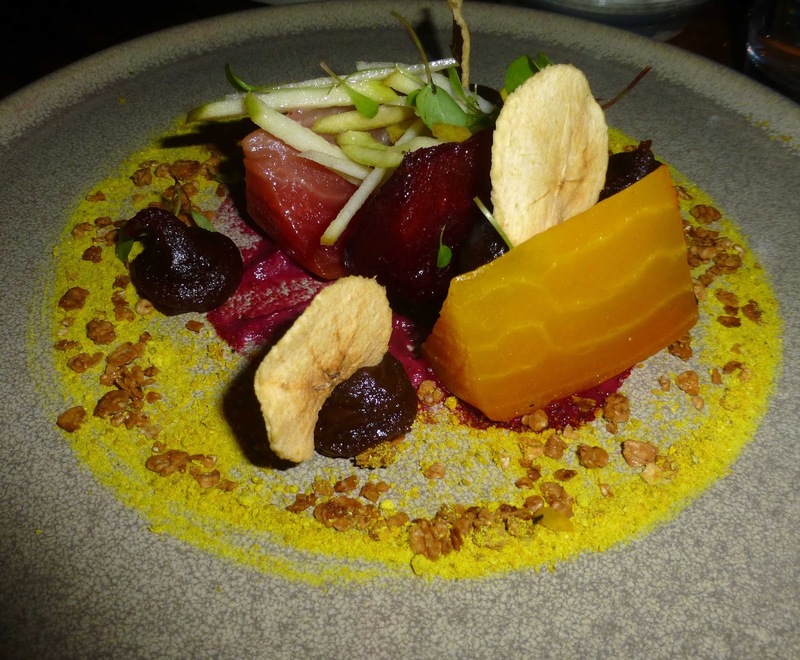 And I also managed a sample of the beets, a lovely mix of textures and flavours. John Dory, gnocchi, shiitake, mushroom butter. 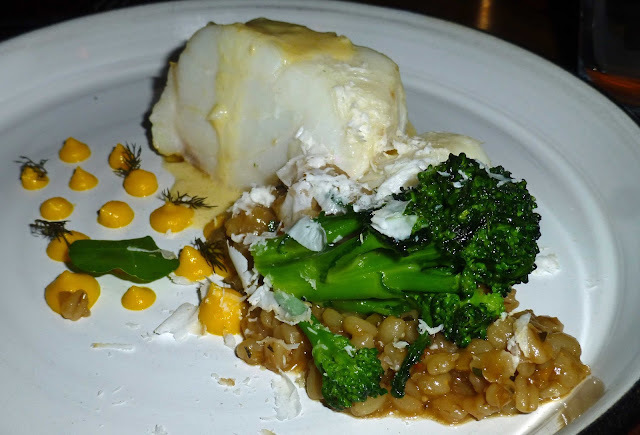 The John Dory was another soft and delicate dish but thoroughly delicious while the Cod was so well matched with the barley and the broccoli. The fish, in each case, looked invitingly fresh, top class. Beef fillet, cheek, bone marrow, lovage. The pork was from Woodside Farm, so I wasn't going to ignore that. And I wasn't disappointed. It was superb, full of flavour. And there was only praise too from CL who enjoyed the fillet, also full of flavour. Two quite perfect dishes really, each well accompanied. Bo Rua Farmhouse cheddar, chutney, nuts. I know the Bo Rua is lovely but my sweet tooth demanded the chocolate, soft, sweet and soon gone. And much the same could be said by CL about her Apple combination. 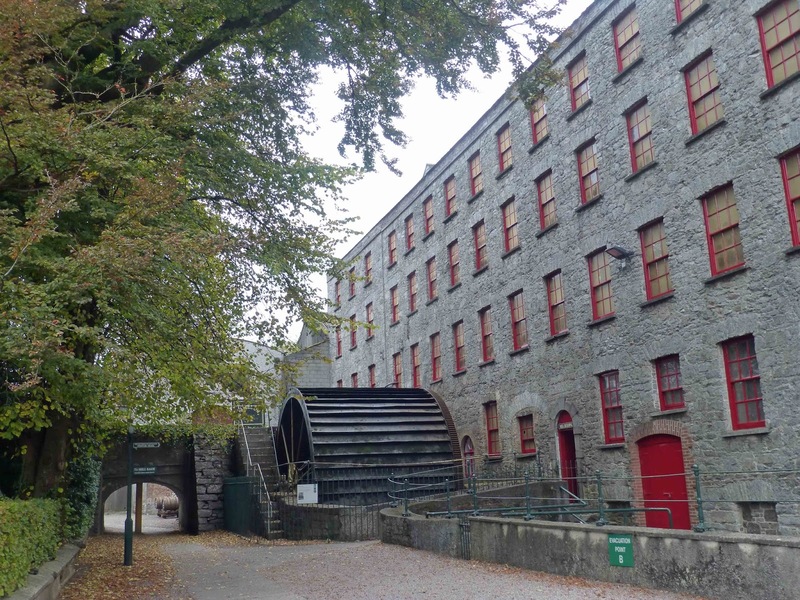 * The next Munster Wine & Dine event is a distillery tour (Bertha's Revenge) and lunch at Ballyvolane House - details here. Many of the organised crime figures in Lewisburg (jail) treated me as one of their own…made sure I received the same food as they did: corn on the cob, pheasant and rice, steak and onions…. … pheasants were ..cooked on a nightly basis around autumn. Traps were set for the pheasants - milk boxes, which fell on them, as they entered to eat loose scattered corn. One night a raid was conducted on the dormitory for narcotics and other contraband. Officer Hill picked up a laundry bag, put his arm deep inside, jumped back and shouted as two pheasants flew out and around the inside of the dormitory and out through an open window. The place was in uproar…Hill was very unpopular. from The 100 Kilo Case by Peter Daly with James Durney (2016). Very Highly Recommended. 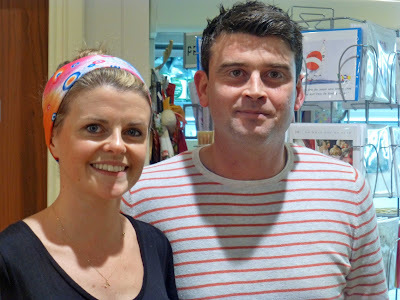 Ali and Patrick are just over 12 months into their adventure at Cinnamon Cottage and the hard-working pair are doing just that, working hard. Much done, more to do, but you can see the difference. 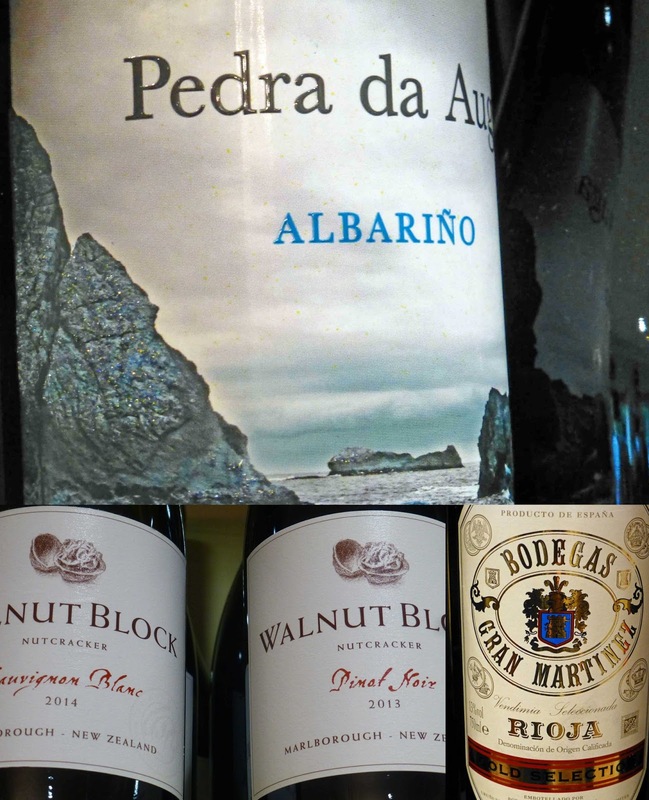 The deli has been expanded and the wine selection has been doubled. And still the work goes on. Fun too. They’re enjoying the run-in to Halloween and you (and the kids, of course!) 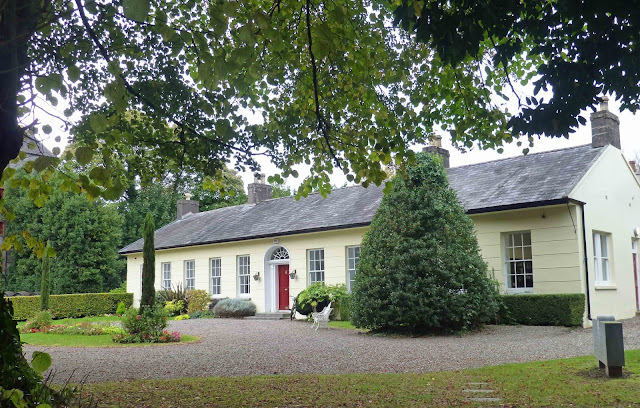 are invited to the Rochestown cottage for face-painting and balloon animals on the Saturday. And don't forget to get the brack, complete with all the bits and pieces, including that all important ring. After that it’s Christmas. More work, more fun. And speaking of Christmas, you can already buy your cake. If you don't want a big one, you can get a small one. A slice will suit some people fine and Ali and Patrick do that too. Lots of cakes here, most available by the slice, including the very popular Coconut and Raspberry cake and old favourites like the Victoria Sandwich! And Chocoholics will be in their element! And they do salads to beat the band, eight to ten freshly made each day, all seasonal. 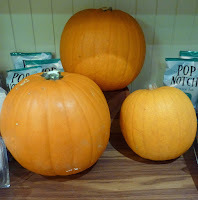 At the moment, look out for the Roast Pumpkin and Butternut Squash with feta and chilli. And then there’s the winter coleslaw. 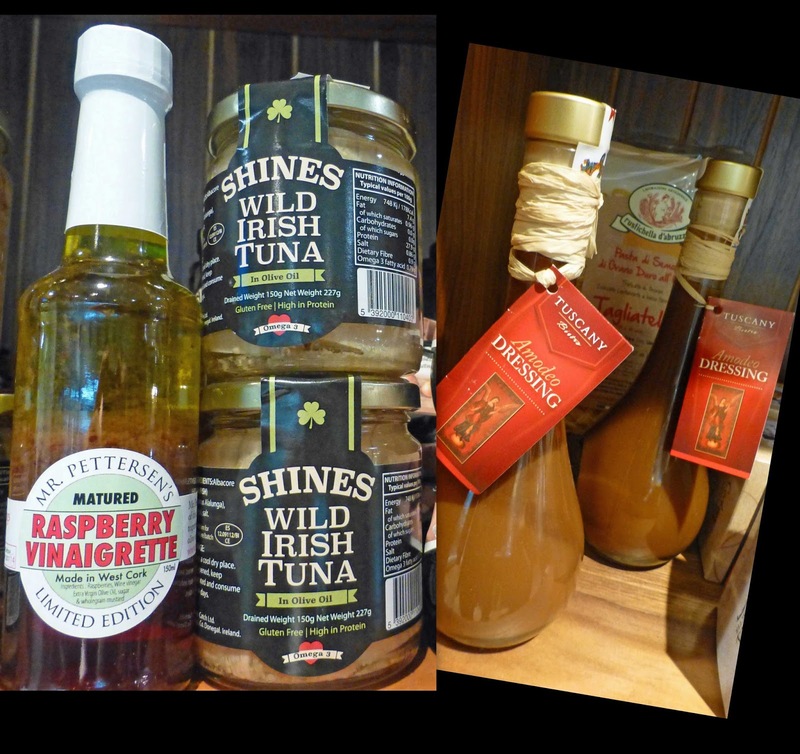 On every cabinet, every shelf, there’s something delicious including a few surprises, jams and chutneys and porridge oats. And they have a selection of excellent cheeses, most of it coming via Sheridan’s. Six months back they started doing Kiddies Meals, with no added sugar, no added salt. Choose from a Mild Chicken Curry, Mac n Cheese, Cottage Pie. You’ll see lots of local produce, beef from O’Connell’s, chicken from Sheehan’s, puddings and sausages and more from Kanturk’s Jack McCarthy, free range eggs and chickens from East Ferry, Shell fish from Dingle, Basil Pesto and Ravioli from Glanmire, popular stone-baked pizza bases made in Ireland by Pizza da Piero, Amodeo dressing from Tuscany Bistro in Limerick, Shine’s Wild Irish Tuna, Green Saffron spices, and the new Irish Tonic Water from Poacher’s in Co.Wexford! And that’s just a handful of what’s available in this treasure trove. And they bake. Not just cakes but breads and buns. Check out those scones and croissants. In the deli counter, you’ll see artichokes, sun dried tomatoes etc. There’s readymade meals, fresh and frozen, including warming soups, chicken and beef dishes and more, and handy side dishes such as Wholegrain Mash with Gruyere cheese! You’ll need a good wine to wash down all that food. And again, no shortage here. 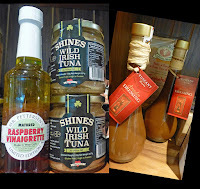 The Cottage have three main suppliers and that adds up to a big selection, including quite a few organic bottles, getting more and more popular, according to Patrick. 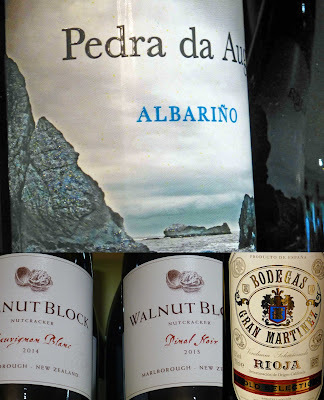 I spotted a few favourites: the Pedra da Auga Albarino, the Walnut Blocks and the Gran Martinez Rioja Crianza. There is so much more in this lovely place, including Badger & Dodo Coffee; I’ve just barely scratched the surface here. It must be the most productive cottage in Ireland. Well done to Ali and Patrick and their staff on a great 12 months. There are eight regularly employed and, on busy days, that can rise to 15, most of them local. A Madregale Duo. Not the same as madrigal! Not the same as madrigal! Having a bit of fun with a pun here. 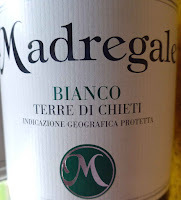 Below, we have a look at two examples of Madregale wines, one white, one red. The Madrigal is a musical work. Maybe after a glass or two of the wine, you and your drinking partners might move on to a Madrigal! Traditionally, polyphonic madrigals are unaccompanied but that is not the case with this example by Monterverdi . The number of voices varies from two to eight, and most frequently from three to six. Back to the wines - don't think I'm up to a madrigal - which come from the award-winning Cantina Tollo, “one of the biggest and best co-operative wineries in the Abruzzo region” of Italy. These two are excellent simple quaffable wines and good value to boot. Light gold is the colour with tints of green. The white fruit aromas are of moderate intensity. There is a tingle on the palate as the fruit flavours roll in with a citrus-y overlay. It is lively and fresh and dry, all combined in a lingering finish. 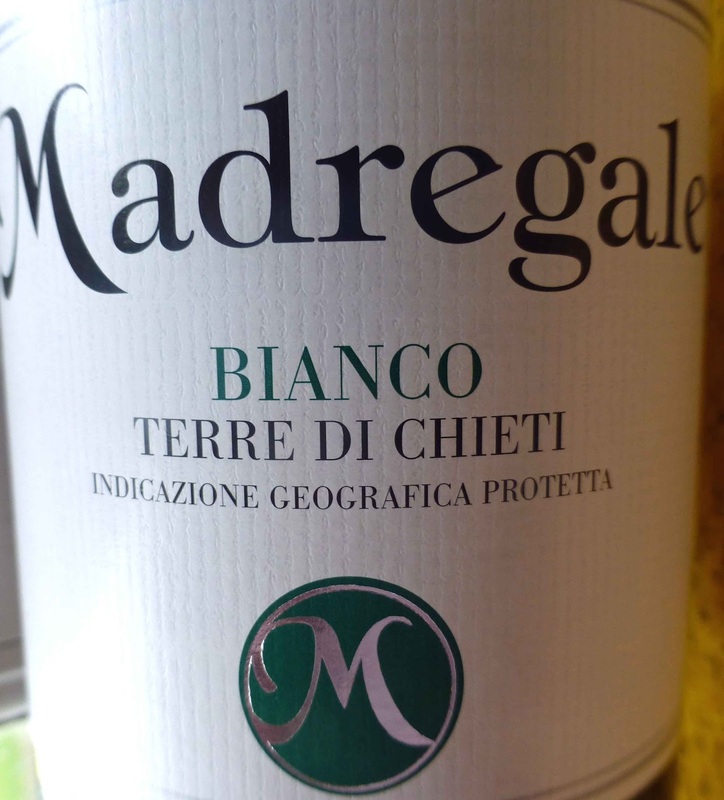 This simple well-made wine, obtained from a blend of Trebbiano and Chardonnay grapes, is an excellent house wine; fine too for parties and weddings and for everyday quaffing. Recommended. Another easy-drinking Madregale, ideal as a summer quaffer or with uncomplicated Italian dishes such as pizza or tomato based pasta. 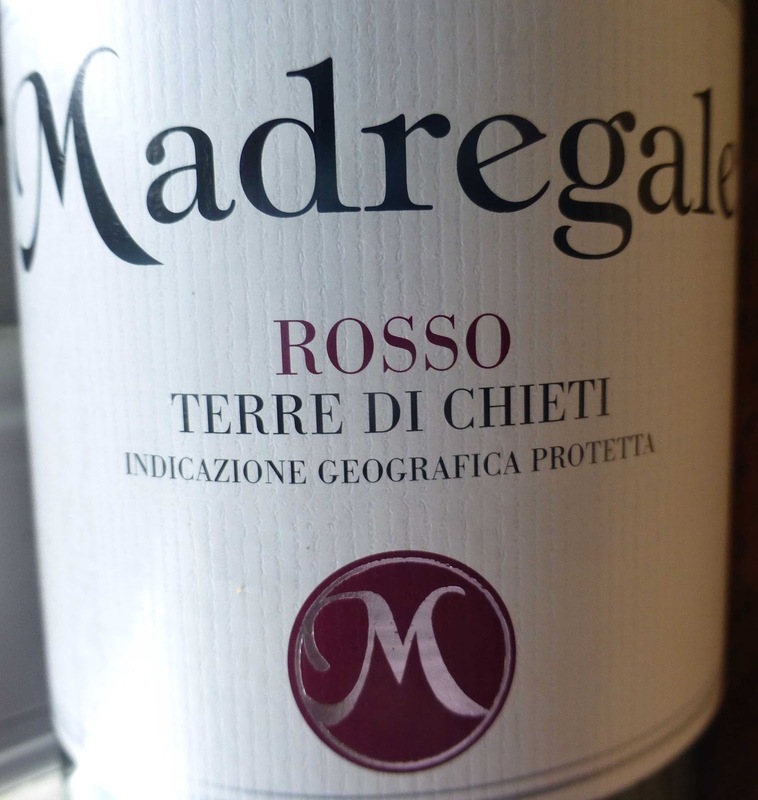 It is a well balanced blend of traditional local grapes Montepulciano and Sangiovese (sometimes Merlot). Colour is purple and there is jammy red fruit in the aromas. Fresh and fruity with typical Italian acidity (they make their wine to go with food). Easy-drinking too - good company on the summer patio or even in a warm winter room. Recommended. If Any Beer Can, Franciscan Well Can! 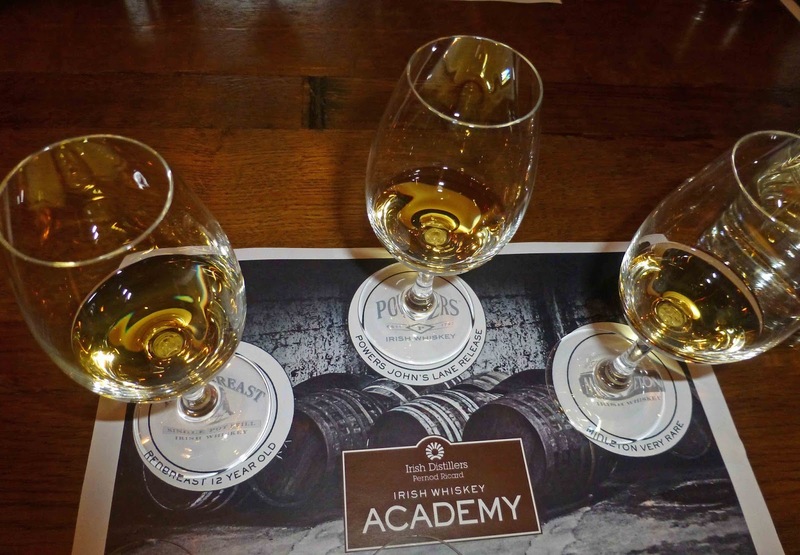 The Whiskeys of Ireland by Peter Mulryan.